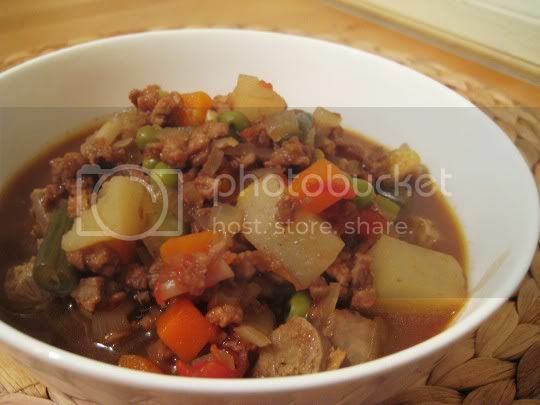 Try this stew once, and you'll never want to eat meat again! Everything but the kitchen sink is in here, so you know you're getting a hearty, healthy, and ultra satisfying meal. Onions, celery, garlic, potatoes, tomatoes, and succotash mix (corn, carrots, lima beans, green beans), plus chopped up veggie sausage links and veggie ground round. All this is cooked in a vegetable stock and simmered for only 45 minutes, so not only is it amazing, but it's quick too! For seasoning, there's savory worcestershire sauce and just a touch of brown sugar for sweetness, fresh minced ginger (maybe a questionable choice, but it adds to the flavor in a very interesting way), and allspice for an almost exotic flavor. The combination of savory and sweet in this stew will greatly please your taste buds and make it hard for you to stop eating this! Leftovers, as you can imagine, hold up wonderfully and seem to taste even better the next day. Sop up the juices with a nice hunk of sourdough bread to make a complete meal. Make again? Definitely. It makes a lot though, so this would probably be best for a crowd, or for leftovers to freeze. "Vegetarian Brunswick Stew," The Vegetarian Meat and Potatoes Cookbook, Robin Robertson. Boston: Harvard Common Press, 2002.